He was bitten by a dog and this has already managed to change his blood type. And since several people have insisted that the virus can’t spread to humans, we know that’s definitely going to happen. Especially since a tiger decided not to eat Jackson after smelling his bitten arm. To drive us down this plot path the team decide to go speak to a scientist who has apparently discovered the “second tier” mutation. I’m not sure why – is this to help the cure? Is there a reason why they have to go? What do they intend to do? And yes, the creature is human. More on that later. I’m not even going to call this a bad decision. It isn’t a bad decision. No human would make this decision. It isn’t a decision. It’s a convoluted plot ploy so the team can run around playing conspiracy and secrecy AGAIN rather than actually work with the support network they now have. It’s clumsy, it’s silly and it’s even worse that it comes from Chloe who was already so badly treated last season. And it bites? A biting elephant? Wouldn’t it actually be really really hard for an elephant to bite? Considering how much easier it would be for an elephant to kill the human another way? This show’s annoying me and it’s only the first double episode. So they decide to hunt the elephant to get a blood sample to see what makes it special – while Abe and Dariela wander off to play with acid-rain causing vultures (no, really). After some more dramatic scenes (Mitch and Chloe on the plane also duel with the raging Korvack who escapes, rampages about a bit being nearly immortal before they lock him up) the gang finally reunites, escaping from vultures, carrying elephant blood and Korvack locked up in the plane’s big cage. Only to discover the elephant is pretty much a normal mutation – and the likely cause of Korvack changing is in his own DNA (which means Jackson is still at risk)… not that they can cure him now because Dariel finally snaps and puts several bullets in his head. Back to Canada – Jaime survived by hiding from the animals because these wolves have no sense of smell. She goes on a nature hike to try and find civilisation – and gets frostbitten and awfulness (it is Canada after all). After suffering mightily for a hellish long time she finally runs into a guy called Lucas. Who is also pretty much lost and freezing. Ok, it’s probably notable that towards the end of this review I became steadily more inpatient. Let me count my frustrations. Speaking of – humans being infected. No. no no BAD idea. I hate this because it has been done. “I am ill and turning into a monster.” Done. Humans degenerating into raging monsters? Oh so done. We do not need another zombie series. 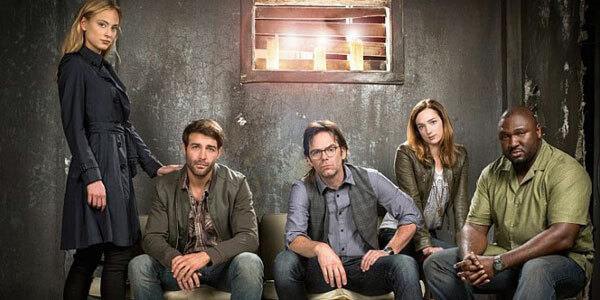 You do not want to turn Zoo into another zombie series. Or even an epidemic series. There’s a lot of these out there. Animals rising up to wipe us all out? Not so much. It’s only the second season, you can’t be out of ideas already!